Life is a road we travel together. It is paved with joy and suffering and with heartaches and happiness waiting around every bend. We are set on this road for a common purpose: to reach eternal life. Our sorrows are the stepping stones to our salvation, and while each day comes with its burdens and with strife, we draw closer to our goal. Every traveler on the road is a precious human being who deserves the chance to find his own way on the journey that is life. Nobody should be denied this opportunity. The chances and possibilities in each human life begin at creation—in which the tiny living creature of God takes his first step on the road rich with potential—and ends at natural death, a death in which the individual is allowed to pass from this world peacefully after fulfilling his journey in this world. Part of God’s plan for our lives comes in the hardships we endure—the crosses God has chosen us to carry. Taking up our crosses with joy and love is how we, as Christians, can inspire others to realize that even the weakest travelers deserve a chance on their own journey, and suffering cannot lessen the value of life. The unconditional dignity of human life is not altered by any weakness or defect. Each baby born into the world is a precious gift, and nothing can take away his value as a child of God. There are countless abortions performed because of medical problems that the preborn child may show signs of. The child is deemed better off dead, and the parents are told they should not bring so much pain into the world. My nine-year old sister, Cecilia, was born with a disorder that affects her organs, which causes countless medical difficulties for her. My parents chose life for their precious daughter, knowing that she deserved a chance, no matter how much pain she might see in her life. Although this little girl has faced more suffering and grief in nine years than many adults have seen in their entire lifetime, she is joyful and bears her burden with unbelievable strength for such a young girl. Even though she has a heavier cross to bear than most people, she still manages to live like a normal little girl, spreading her sunny smile and inspiring others to offer their suffering to God. People like my sister prove that true joy is not found in a perfect, pain-free life. True joy comes from being loved by God. He created everybody for a purpose unique to them, perfectly suited for their abilities and weaknesses. Even the most vulnerable of His children are entitled to a chance to travel their own path on the road of life, regardless of their differences or disabilities. Each precious child is called by the Father to His kingdom, and He looks in the heart, not at outward appearances and imperfections. “We Christians, being instructed in the faith, know that suffering can be transformed—if we offer it to God—into an instrument of salvation” (St. John Paul II). For Christians, suffering should not have a negative effect on our joy. Jesus suffered as a man. Following in His holy footsteps is an honor, and being able to offer our small sacrifices to God is how we grow in holiness like Him. Offering the smallest of our sacrifices to Him is how we can take up our crosses in our everyday lives. When we show joy in all that we do, and retain our joy even when we are faced with struggles, we can set an example to others. Our personal crosses can come in many forms. Even though we don’t all have large crosses to bear, we all struggle with small, personal sins and weaknesses. We can overcome these struggles to be charitable to the people in our lives. 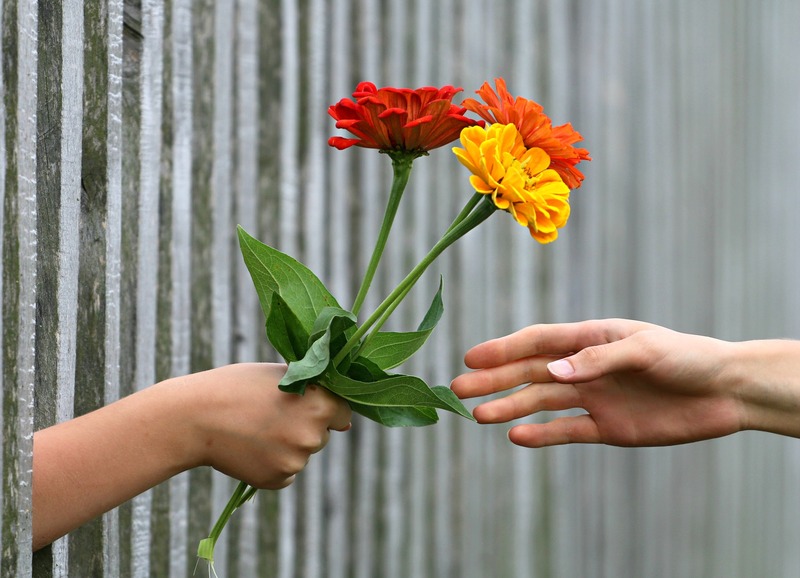 Small acts of kindness have the power to change people. Smiling at a cranky salesperson, holding back negative comments, and refraining from getting angry at irritating people are all things that we can be doing in our everyday lives. Everyone should be treated with the respect they deserve as a beautiful creation of God, and when we, as Christians, show people kindness in simple ways, we are assuring them of their dignity. In a culture where babies are killed, the elderly are euthanized, and people who are sick or disabled are considered less-than-human, even the simplest acts of love can impact people. As students, we should be forming the pro-life generation by having the courage to step out of the flow of the culture of death. When we live our lives with infectious joy no matter what comes our way, and encourage the people around us to live the same joy, we are teaching others that suffering does not affect the value of life, and that even a weak traveler has a path on the road of life. Every year I go to a senior home with a group of friends to sing carols and give out cards and small gifts to the elderly. In the past, my youth group has gone to elderly people’s homes from the parish and helped them with yardwork and cleaning. When we live a life modeled after Christ, there are so many little things we can do to show others His example. We don’t need to have extraordinary lives in order to make a difference. All we need is to be content with our state in life, take our burdens up with joy, and reach out to others with kindness, including that person who is always left out. We can also listen and care for a friend who is going through a difficult time. This is all we need to build a culture of life. If every Christian took up his cross with an effort to please God, while showing true empathy to others, our culture would begin to recognize life as a precious gift. “Be faithful in small things, because it is in them that your strength lies,” Mother Teresa writes, and her words ring true for us as the future pro-life generation. Together with our fellow travelers on the perilous journey to heaven, we can reshape the culture that we live in, so saturated with money, power, and perfection. With small acts of joy and little sacrifices of great love, we can show others the dignity of life by the way we treat our fellow journeymen. Every traveler on the road has a different story, and everyone has his own unique way and cross. No one on the road is perfect, but every person has a right to live his life and travel the road, and nobody should have the power to take that gift away. The road of life will test and try us, drag us down and dampen our joy. It is up to us to have the courage to stand out. Be different. Show a smile to everyone around you. Let people know that their lives are precious and worth living and that their suffering on this road only draws them closer to the glorious end where we will be united with God. © 2018 Sophia Clark. Published with permission.